Competitive cooking shows have carved out a sizeable niche in your TV-watching diet. From out-of-the-box time-sensitive challenges on Chopped to relatable home cooks vying for a trophy on MasterChef, cooking shows with something at stake are remarkably popular. Seeing more slicing and dicing at home inspires many casual cooks to up their game, and the BergHoff 3-Piece Stainless Steel Knife Set is a worthy addition to the tools in your kitchen. 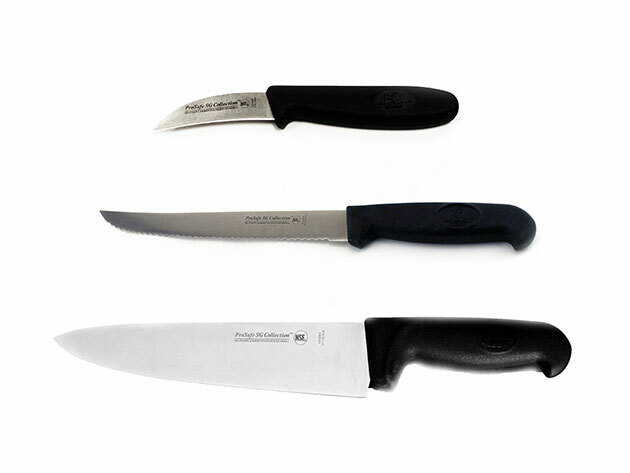 This set of three expertly-weighted knives contains a multi-use chef’s knife, a scalloped utility knife, and a peeling knife. They’re all made of tough stainless steel for perfect slices every time. The slip-resistant grip has anti-bacterial and anti-microorganism properties, protecting you and your family from the risks of raw meat. All three knives are NSF-certified, meaning that they meet strict public safety standards. They’re high- and low-temperature resistant, so you can create meals with hot or cold ingredients without worrying. They’re also freezer-safe for extra protection with chilly recipe components. Usually, it costs $77 to take your TV-cooking inspiration and turn it into delicious food. However, right now you can take your home chef skill to the next level with the BergHoff 3-Piece Stainless Steel Knife Set for only $39.99 (48% off).